The daughter of Eliam (II Sam. xi. 3; but of Ammiel according to I Chron. iii. 5), who became the wife of Uriah the Hittite, and afterward of David, by whom she became the mother of Solomon. Her father is identified by some scholars with Eliam mentioned in II Sam. xxiii. 34 as the son of Ahithophel. 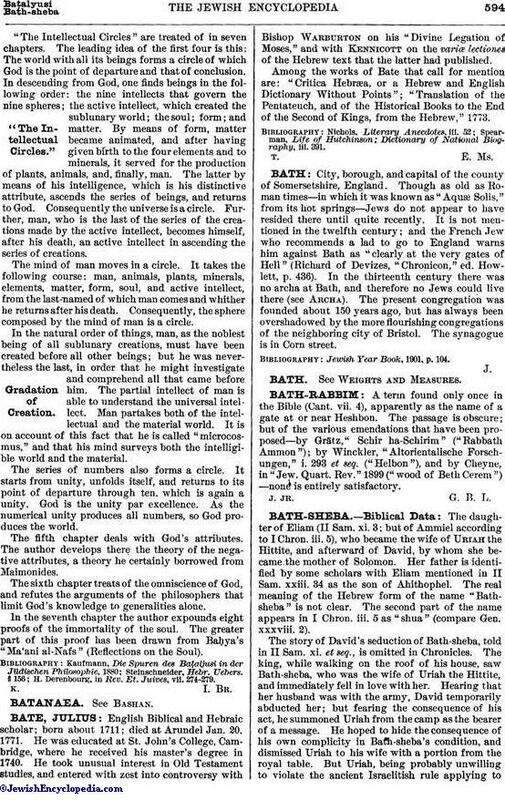 The real meaning of the Hebrew form of the name "Bathsheba" is not clear. The second part of the name appears in I Chron. iii. 5 as "shua" (compare Gen. xxxviii. 2). The story of David's seduction of Bath-sheba, told in II Sam. xi. et seq., is omitted in Chronicles. The king, while walking on the roof of his house, saw Bath-sheba, who was the wife of Uriah the Hittite, and immediately fell in love with her. Hearing that her husband was with the army, David temporarily abducted her; but fearing the consequence of his act, he summoned Uriah from the camp as the bearer of a message. He hoped to hide the consequence of his own complicity in Bath-sheba's condition, and dismissed Uriah to his wife with a portion from the royal table. But Uriah, being probably unwilling to violate the ancient Israelitish rule applying towarriors in active service (see Robertson Smith, "Religion of the Semites," pp. 455, 488), preferred to remain with the palace troops. The king in desperation gave the order to his general, Joab, that Uriah should be abandoned to the enemy in battle. After Uriah's death David was left free to make Bath-sheba his wife. According to the account in Samuel, David's action was displeasing to the Lord, who accordingly sent Nathan the prophet to reprove the king. After relating the parable of the rich man who took away the one little ewe lamb of his poor neighbor (II Sam. xii. 1-6), and exciting the king's anger against the unrighteous act, the prophet applied the case directly to David's action with regard to Bath-sheba. The king at once confessed his sin and expressed sincere repentance. Bath-sheba's child by David was smitten with a severe illness and soon died, which the king accepted as his punishment. Bath-sheba soon became the favored wife, and, with the aid of Nathan, was able to obtain the succession-rights for her son Solomon (I Kings i. 11-31). Bath-sheba, the granddaughter of Ahithophel, David's famous counselor, was only eight years and eight months of age when her son Solomon was born, while some maintain that she was not older than six (Sanh. 69b). The influence of the evil tempter of humanity brought about the sinful relation of David and Bathsheba. Bath-sheba was making her toilet on the roof of her house behind a screen of wickerwork, when Satan came in the disguise of a bird; David, shooting at it, struck the screen, splitting it; thus Bathsheba was revealed in her beauty to David (ib. 107a). Bath-sheba was providentially destined from the Creation to become in due time the legitimate wife of David; but this relation was immaturely precipitated, and thus he became Bath-sheba's partner in sin (ib.). Bath-sheba is praised for her share in the successful effort to secure the succession to Solomon. Thus the verse in Eccl. iv. 9, "Two are better than one," is applied to David and Bath-sheba; while "the threefold cord" which shall not be quickly broken (ib. verse 12) is applied to the activity of Nathan the prophet, who joined in the effort (Eccl. R. iv. 9). For further details see David in Rabbinical Literature. "And has the story of the antagonists come to you; when they climbed the wall of the upper chamber, when they came in to David? And when he feared them, they said, 'Fear not; we are two antagonists, one of us hath wronged the other, so judge justly between us. . . . This my brother had ninety-nine ewes and I had one. Then he said, "Give me control of her," and he overcame me in his plea.' David said, 'Verily he hath wronged thee by asking for thy ewe as an addition to his ewes, and verily most partners act injuriously the one to the other, except those who believe and work righteous works; and such are few.' And David supposed that we had tried him; so he sought pardon of his Lord and fell, worshiping, and repented. And we forgave him that fault, and he hath near approach unto us and beauty of ultimate abode." From this passage one can judge only that some echo of Nathan's parable had reached Mohammed. The Moslem world has shown an indisposition, to a certain extent, to go further, and especially to ascribe sin to David. As the commentator Baidawi (in loc.) justly remarks, this passage signifies only that David desired something which belonged to another, and that God rebuked him by a parable. At the very most, Baidawi continues, he may have asked in marriage a woman who had been asked in marriage by another, or he may have desired that another should abandon his wife to him—a circumstance which was customary at that time. The story of Uriah is regarded as a slander. What to Mohammed was probably only a somewhat mysterious exhortation to just dealing was made the foundation of an extensive legend. The subject is called emphatically "the Sin of David." Filled with spiritual pride, he asked a trial from God. One story is to the effect that he wished to gain the same rank that the Patriarchs had enjoyed, and that God told him that he must be tried as they had been. Another is that he thought he could endure a whole day without sin. God accepted the challenge, and Satan came upon him and allured him from his devotions with a dove of gorgeous plumage. It led him to where he caught sight of Bath-sheba bathing. The story then follows the Biblical model, with the following changes: There is no sin with Bath-sheba before the death of Uriah, nor is there the episode of the return of Uriah and his sleeping in the king's house. There is no child that dies, and in the Koranic narrative the part of Nathan is taken by the two angels. After the death of Uriah, David marries Bath-sheba, and she becomes, according to most sources, the mother of Solomon. To Moslem legend Bath-sheba herself is a very shadowy figure, being generally called simply the wife of Uriah. See Al-Tha'labi, "ḳiṣaṣ-anbiyya," pp. 243 et seq., ed. Cairo, 1298; and Ibn al-Athir, i. 95 et seq., ed. Cairo, 1301. Her name, which perhaps means "daughter of the oath," is in I Chron. iii. 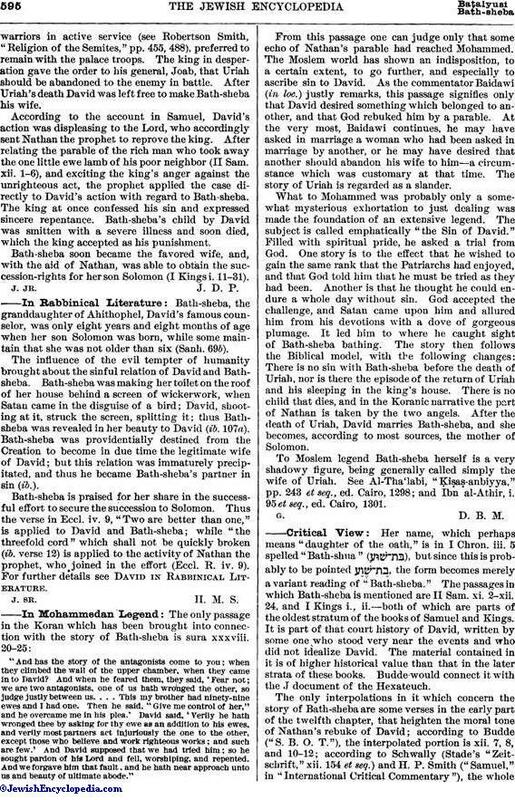 5 spelled "Bath-shua" ( ), but since this is probably to be pointed , the form becomes merely a variant reading of "Bath-sheba." The passages in which Bath-sheba is mentioned are II Sam. xi. 2-xii. 24, and I Kings i, ii.—both of which are parts of the oldest stratum of the books of Samuel and Kings. It is part of that court history of David, written by some one who stood very near the events and who did not idealize David. The material contained in it is of higher historical value than that in the later strata of these books. Budde would connect it with the J document of the Hexateuch. The only interpolations in it which concern the story of Bath-sheba are some verses in the early part of the twelfth chapter, that heighten the moral tone of Nathan's rebuke of David; according to Budde ("S. B. O. T."), the interpolated portion is xii. 7, 8, and 10-12; according to Schwally (Stade's "Zeitschrift," xii. 154 et seq.) and H. P. Smith ("Samuel," in "International Critical Commentary"), the wholeof xii. 1-15a is an interpolation, and xii. 15b should be joined directly to xi. 27. This does not directly affect the narrative concerning Bath-sheba herself. Chronicles, which draws a kindly veil over David's faults, omits all reference to the way in which Bathsheba became David's wife, and gives only the names of her children. 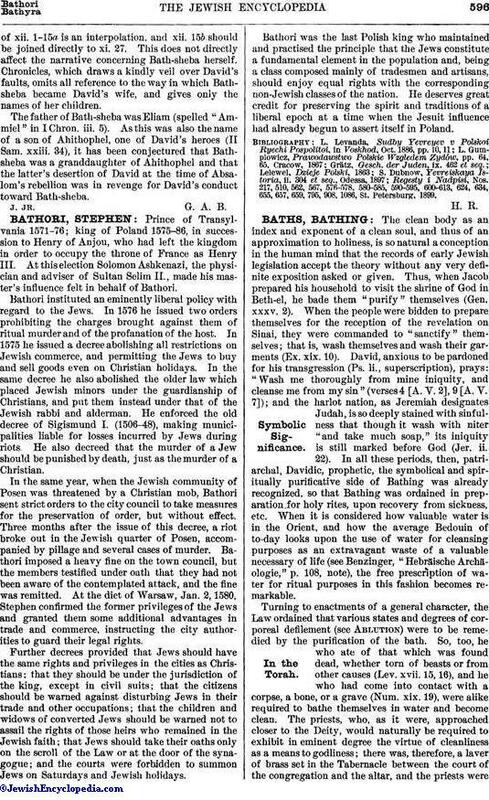 The father of Bath-sheba was Eliam (spelled "Ammiel" in I Chron. iii. 5). As this was also the name of a son of Ahithophel, one of David's heroes (II Sam. xxiii. 34), it has been conjectured that Bathsheba was a granddaughter of Ahithophel and that the latter's desertion of David at the time of Absalom's rebellion was in revenge for David's conduct toward Bath-sheba.